When you say diamonds are forever, it may also mean it costs a fortune. This brilliant light pink oval engagement ring displays a classic heavyweight diamond rock that can possibly outshine the empire state building. This most-talked about ring is Blake Lively’s engagement ring from Ryan Reynolds. Designed by the famous jeweler Lorraine Schwartz, this $2million ring was custom-made by the couple in a Rose gold setting. Reminiscent of the Victorian Era; this Mark Broumand oval cut diamond ring will definitely bring you back to your ancestors. The flawlessness of the diamond shines brilliantly along with its platinum metal setting. 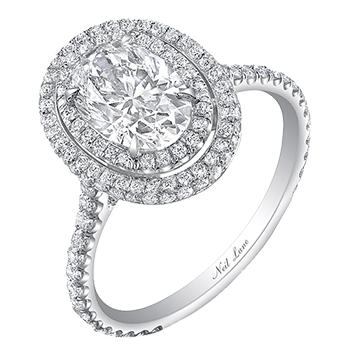 With a double halo circling the 3.02ct oval cut diamond, this ring will surely keep everyone staring from blinking. The price of this ring starts from $3,000-$5,000. 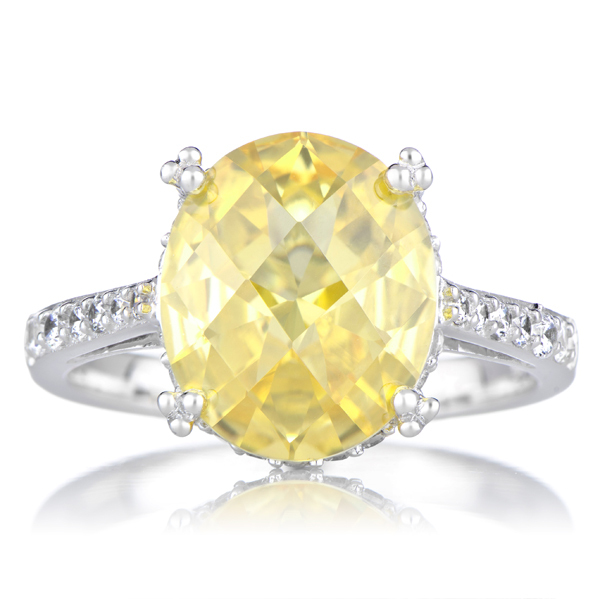 If you adore Heidi Klum’s engagement ring that was once from Seal, here is an inspiration from Tiffany & Co. called the Tiffany Enchant Yellow Diamond Ring from their Yellow Diamond Collection. The beautiful flower petal-like frame of round diamonds surrounding the Canary stone creates a beautiful sparkle in daylight. Combined with platinum and 18k Gold metal is surely a fancy scene stealer for the price range of $5,000-$15,000. If diamonds might be too cliché for you, then Princess Diana’s Harry Winston Blue Sapphire Engagement Ring design is what you might be looking for. This ring from Gemvara costs roughly around $10,000. Not bad if you compare it to the original — Harry Winston’s design of Princess Diana’s ring during the 90’s costs $65,000. The double halo micro pave design framing the ocean blue gemstone is a perfect complimentary sparkle to the cut center stone. 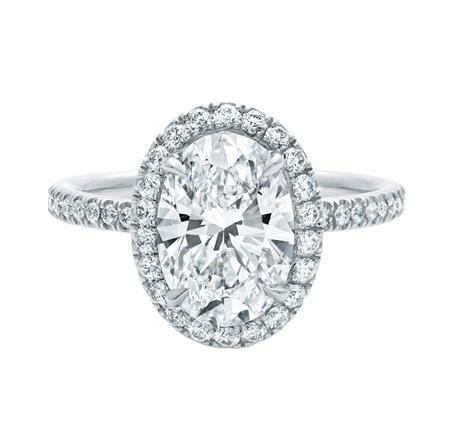 This other Harry Winston classic is set in platinum with an oval diamond of 2.07 carats. 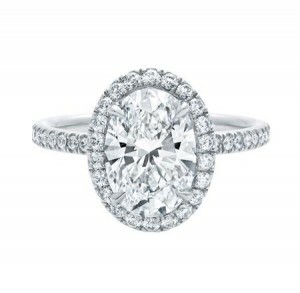 Paved in white round diamonds, this simple yet sparkly ring will surely melt every woman’s heart. After all, Harry Winston is not a famous celebrity jeweler for nothing. That is why his pieces, especially this fine ring usually starts at a higher price bid of $60,000-$100,000. Black is truly beautiful. 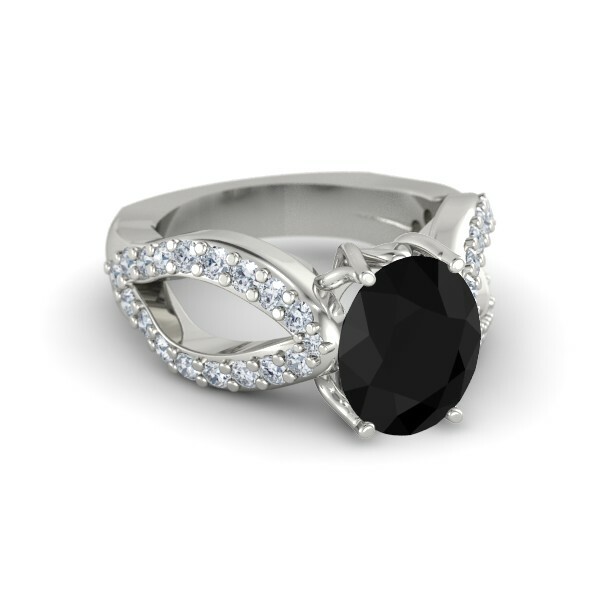 The black diamonds have become more in demand for engagement rings nowadays. The open shank design of this ring from Gemvara makes it dramatically elegant. Surrounded by 18 white diamonds in a 14k White Gold and Platinum, this $3,000 ring is definitely not bad to complete a well-staged marriage proposal. 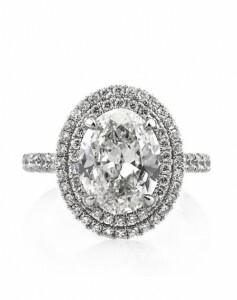 Another Lorraine Schwartz masterpiece has become a popular choice for custom-made engagement rings. Celebrity Rebecca Romjin wore a 6-carat yellow dangling engagement ring set in yellow gold. Its eccentric design can intimidate men who are into traditional engagement ring pieces. However, if your man knows you too well and thinks you are the queen of divergent, then he might want to invest on this fancy bling costing around $10,000-$50,000. 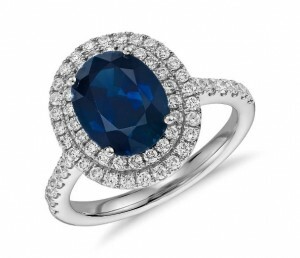 Gemstones are pocket-savvy when it comes to engagement rings. 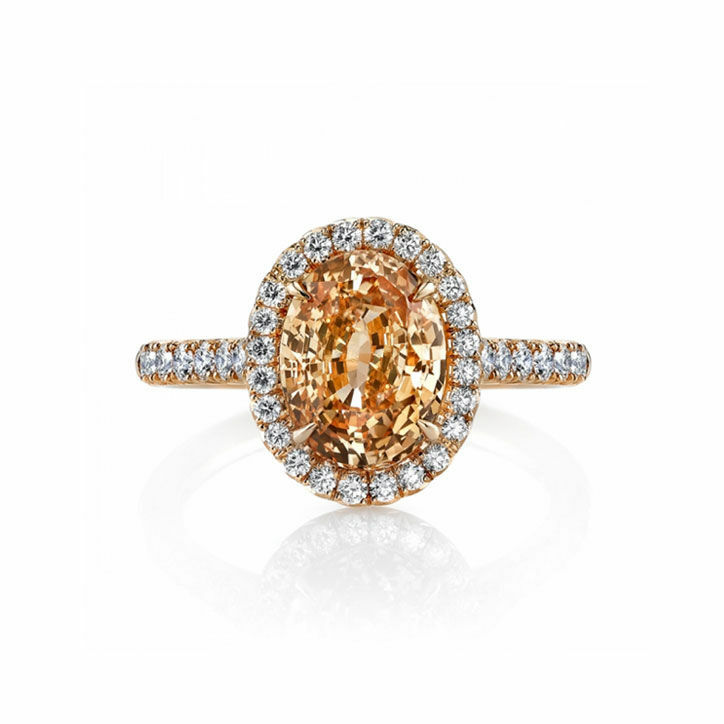 Shaped based on the classic brilliant oval stone cut, this Orange Sapphire in micro pave and halo diamonds works perfectly like a married couple. Choosing this ring is certainly a wise move if you are a bit cynical about the whole wedding proposal to stage. Price for the orange sapphire from Omi Gems is quoted upon request depending on the ring’s carats. 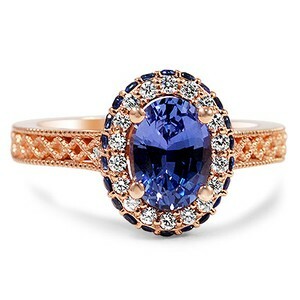 When you combine vintage, gems, classic and unique, this ring comes to life. The Blue Oval Sapphire Gem is surrounded by a halo of sparkling white diamonds with tiny blue sapphires that adds accent to the outer rim of the halo. The vintage feel of the Milgrain-embellished trellis pattern of the band will make your ring stand out from the list. 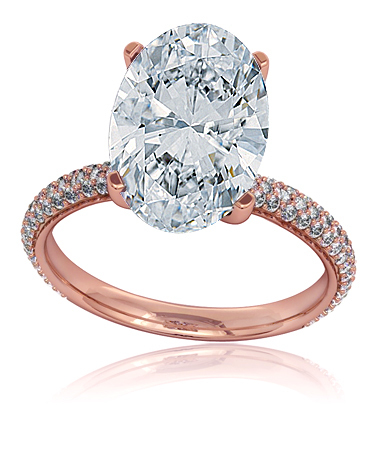 Rose Gold alone is expensive, so an expected price range of $2,000-$5,000 could ease or tease your pocket. 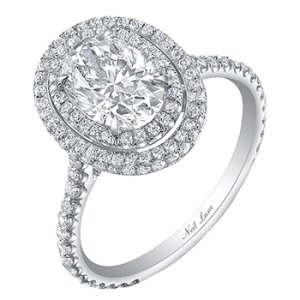 Besides the fact that it is a Neil Lane Classic, engagement rings made of platinum metal are fancier, yet hardwearing compared to white gold. Both have the exact polished silvery white appearance, yet platinum ages more beautiful than white gold. This is exactly why this Neil Lane Classic is a show stopper to every engagement party. 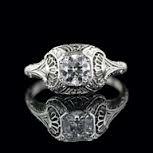 Oval shaped Diamond Platinum Ring usually costs around $5,000 and up. Now that you have seen 10 of the most beautiful oval engagement ring pieces, would you go for boldness, uniqueness or sophistication? Think about finding a ring that defines more of you and not the whole human race. After all, what is a big brilliant rock with hollow intentions anyway? The most important meaning of any engagement ring is the commitment, loyalty and love you share.